Today it is crucial that musicians be implicated in the creative process so that composers can create works that are not only highly personal, but also “belong” to the ensemble they are created for, such that even the personality and experiences of the musicians become integral parts of the work. While working on my third collaboration with Berlin-based LUX:NM ensemble, I encountered William Kentridge’s “Take Off Your Hat” (2014) during an exhibition in Berlin. The documentation of this transdisciplinary artist creating his work on a lengthy strip of rice paper struck me almost as much as the result, and helped catalyze the conception of something like this but not this and not that either (2017). 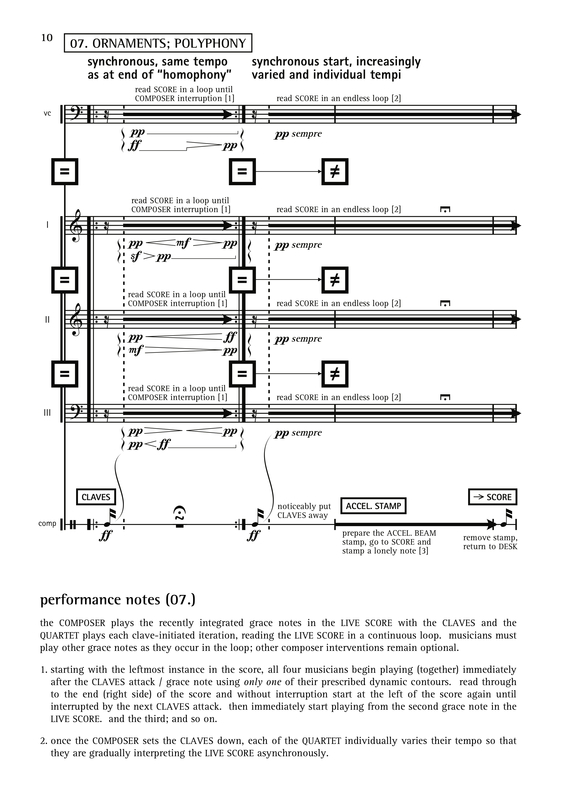 Action, text and traditional notation, a preoccupation with unique musical forms that are intimately linked to their musical materials, and the personal input, feedback and involvement of the musicians throughout the creative process converge in this work for 4 musicians, composer and live-composed score. something like this… was commissioned by LUX:NM with the support of the canada council for the arts. click on the images below to view excerpts of the score, or download the entire score (there are no parts) from the menu on the right. contact the composer to request performance materials. TRAILER — LUX:NM performing jef chippewa’s something like this but not this and not that either in the kontraklang series at heimathafen in berlin on 10 september 2017. andreas voss (cello; guest), ruth velten (sax), silke lange (accordion) and florian juncker (trombone), with the composer. following musical and staging instructions in the performance score (leitpartitur), the ensemble and composer together create the live-composed/-notated musical score from which the musicians play in parallel. a series of “scenes” explores different ways of creating, altering, interpreting and performing the notation created in real time (i.e. during the actual performance). the stamps used to make the live-composed score are linocuts of music symbols (notes, articulation, etc. ), some of which are musically thematized as they appear in the score. the performance lasts around 24 minutes — some individual processes require several minutes — but it could also possible to compress some sections for a duration of 14–18 minutes, in case programming limitations or artistic decisions prohibit the performance of this length. commissioned by LUX:NM contemporary music ensemble (berlin) with the support of the canada council for the arts. for information on obtaining high-quality printed performance materials, contact the composer.